Being a newly eggless baker, finding good egg substitutes for your baked goods at home can be an overwhelming task. Well, fret no more! Here is a bit of clarity and guidance to help you understand what egg substitutes are out there and what type of baked good it can best be substituted into. I choose not to use eggs when I bake purely based on a preferential stance. Mainly the smell. I have a really difficult time enduring the smell of eggs that is left over not only in the bowls and sink but also the odor it can emit in some baked goods. If I can smell or taste it, it grosses me out and I can’t finish it. I’m not really sure when this began for me but it definitely got worse in the past 2 years to the point where I just refuse to bake with them. Paired with my dairy allergy, I tend to unintentionally fall into the “vegan” category in the kitchen. We all have our personal reasons why we each started this eggless journey. Whether you are allergic, have difficulty digesting, are morally against, or have an unexplainable repulsion towards the smell of eggs like I do, we all have questions and need a place to start. Especially for the new traveler, help is greatly needed to map out what exactly are good egg substitutes and which ones work best for certain baked goods. So let’s not waste anymore time and get to uncracking egg substitutes, shall we? Egg substitution is fairly simple. Each item listed below is an easy go-to measurement for replacing 1 egg for a recipe. If the recipe calls for 2 eggs, simply double the amount. Please note that not every item listed should be substituted in every situation. Part of the journey is researching and having an appetite for knowledge. It’s empowering, I promise, despite how overwhelming it may seem. Get to know these items and start experimenting in your own kitchen. You might find a different preference than what I have…and that is the beauty of individuality. Each item has its own purpose and role in a certain type of baked good. For example, if I am looking for a crunchier cookie, I am going to opt for an item that will harden the cookie, like a starch (EnerG would work great here) would do the trick. The opposite would be quite true: If I am trying to create a chewier cookie, I would opt for a fruit puree like applesauce or even pumpkin puree since these create a moist, tender bite. *Please note that this list is not the last word on the matter. This is simply my own interpretation of eggless baking that I have grown to understand over the past couple of years. There will always be new items to be added here as well as current items that I have omitted because I do not have experience using them. I believe that I cannot be a resource to you if I have no idea what I am talking about so I have limited the list to what I do know. I hope this proves to help you in the beginning steps to becoming an eggless baker. So what are we waiting for? Let’s start baking and see what kind of eggless goodies we can create! what substitutes can be used to create a crispy cookie like gingersnaps? thank you for the possibilities, but if someone else has tried them and can give me an answer, it will save my disposal! Can you please clarify what the measurements would be for 1 egg regarding the baking soda, vinegar and non-dairy milk? It looks like 1/2 TBSP vinegar and 1/2 tsp baking soda, but what about the milk? Also, I’m confused what you mean about replacing with 1/2 tsp baking powder if not in the recipe? Do you mean to use baking powder instead of baking soda if the soda is not already in the recipe? Also, I’m looking at this for replacing eggs in a cake. Thank you! You can use the liquid from a can of chick peas as a substitute for a whole egg in baking (cakes etc) or for coatings before frying. It requires a little more beating than egg though. For a 5 minute mix for a whole egg you need to beat the chick pea water for 15 – 20 minutes. It’s also a good excuse to make some hummus with the chick peas. How much of this water should be used for 1 egg? Cashews work really well (soaked, drained and blended in a high speed blender with a liquid), tofu or even a nondairy cream cheese would work. I have a recipe over here that is for key lime pie bars (which could easily translate into cheesecake) that tastes great! Great article! There really is no need for eggs in baking with all the great substitutes available. My very favorite for quick breads and muffins is aquafaba! It makes them so soft and fluffy! May I add…all the rage right now for Aquafaba (spelling?) made from garbanzo beans…I’ve not tried it yet though. Yup, you are right! I will need to eventually add that in 🙂 I have tried it and it’s rather spectacular!! 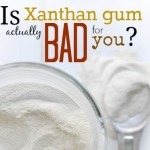 I am new to replacing xantham gum and I know that many egg replacers can also sub for xantham. Where do you buy chia seeds and psyllium husk? I’m glad I can also use these as egg replacers, too. Thanks! I was 35 when I had my last child and developed a distaste for eggs in my last trimester. By the time he was 9 months old we discovered he had an egg allergy (and I still couldn’t eat them or stand the smell!) I used ener-G for nearly every baking recipe successfully, except for brownies. They were always hard and dry even when shortening the time. I gave up on brownies. I’m so excited to try some of your suggestions so I can have brownies again. My son and I thank you! Been Ovo-Lacto Veggie for years and earlier Vegan baking recipes disappointed–came out like brick bats. But this wide range of egg and dairy substitutes and what they’re good for has inspired me to take the plunge into Vegan baking again. Thanks for putting all this info together. Now my convictions and my diet can march along together. Oh yes! I LOVE hearing that Kathleen!! You might also be interested in knowing that I am putting together a Tell-All Baking Secrets ebook about baking gluten, egg, and dairy-free that is coming out next month 🙂 That will be of great help for you too! Why did it take me so long to find this? I often wondered about the other egg substitutes and you did all the work for me. Thank you very much. mix in a mug and add to your baking recipe – we use it in boxed cake mixes, brownies, from-scratch cookies… you name it! and it’s great because those ingredients are usually in your pantry anyway. Absolutely stoked I have stumbled across your site Cara! With allergies to nuts, eggs, some seeds and kiwifruit (! ), and being gluten free, I know your resources and recipes will be a major help with my baking experiments! My 14 month old son was diagnosed with a severe egg allergy, among other food allergies, at 8 months old. His father & I have never had any food allergies & we were FLOORED. It was terrifying for awhile! I have been looking for great “egg free” recipes and found your blog. Thank you so much for your story & all of the great recipes! And they recommend an egg yolk to help hold the fishballs together. Which substitute in your opinion will help best acheive this in lieu of the egg yolk? And to what amount? Try 1 Tbsp. flaxseed meal + 2 Tbsp. water. Allow to sit for 5 minutes to thicken. You might need more breadcrumbs (if the recipe calls for it) seeing that it might be more liquidy than 1 yold but it should do the trick. My teenage son has recently decided to become vegan…. yet I am a big baker. His decision is making some big changes in my kitchen. These are helpful, thank you. Wow! I really love your blog. Very informative on any topic, keep it up! This is terribly helpful! I’ve only ever used the flax meal but have often wondered how chia would work. You’re the queen of gf science, lady! Very timely on this thanks for all you do! Yep, you are pretty much AMAZING! Not that I didn’t already know that. I bet Veg News comes a knocking for this one soon. Cara these infographics and photos are stunningly beautiful, okay and wicked helpful too lady. I’m totally sharing this as far and as wide as I can. Love it! Do you have a suggestion for eggs in pumpkin pie? very helpful, but I have one issue with the post: you used eggs! I love this guide. I share your issue with eggs. I think mine goes back to when I was about 13 and we had moved to the country with a house that only had well water, which was black and smelled of sulfur. I refused to take a bath for a long time and eventually my dad treated the water but still, ugh! I don’t like eggs but wish I did. Just can’t deal with them. WOW…GREAT Post!!! Thank you so much…This is EXACTLY what I needed to take out the guess work!!! I just shared this on FB, and told everyone to print it out, to keep handy in their kitchen. I have just been researching this topic, and yours is ‘BY FAR’ the BEST out there! Thanks for ALL of your GREAT work, making our lives easier!!! Thanks for this list! I usually only use flaxseed, but good to know there are other alternatives. I found a mixed roasted nut recipe for the holidays that calls for an egg white- any suggestions for a substitute? What is the recipe for? I think that can help me better understand what a good sub could be for it. The only thing I usually use for egg white subs is EnerG (1 1/2 tsp) mixed with just 2 Tbsp of water according to its directions on the box. The great thing about this product is that you can even use an electric mixer to it and it will begin to form soft peaks. I’m curious if others have done different options and what they are? GREAT post! This will make a wonderful reference for myself since I am fairly new to vegan baking. fantastic resourceCara, thank you for compiling and educating us!